The best Christmas present of all is having family together and this year we were delighted to have Chris, Alex and Dan and Moogie (in order of arrival) here for a great Christmas visit. Alex and Dan, who had received a pasta maker as a gift last Christmas, gave Christopher one this year. Then Alex and Dan (grounded in Lincoln for an extra 24 hours because of a snow storm) and Christopher decided to shop and make dinner the night after Christmas. A real treat for me! They made fresh pasta and cooked a wonderful pork ragu from a recipe Alex and Dan had used before (omitting the pancetta, mushroom demi glaze and using considerably less pork). This was a gift that kept on giving. 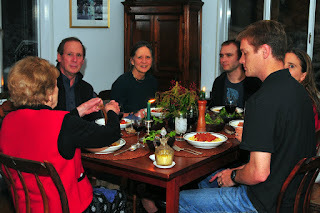 Ed and I enjoyed the rest of the Pork Ragu, albeit with store bought fresh pasta for New Year's (photo lower left).